Klipboard has introduced a new feature which allows you to have valuable communication with your clients and ensure you are providing them with the best service possible. As well as being able to send automated follow up emails with surveys enabling you to receive essential feedback from your clients, you are now also able to send automated calendar invites with reminders of scheduled tasks ensuring they are kept fully up to date. 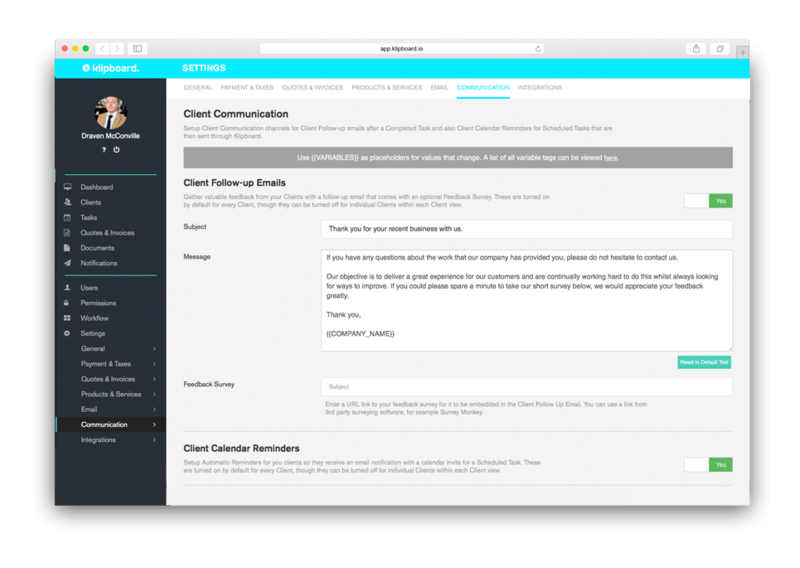 Within the settings area of your web admin dashboard, there is a communication section where you can set up client follow up emails, along with a feedback survey for vital feedback from your clients. An editable text area allows you to determine the email message with a range of variables available to focus and personalise the email. Similar to existing client communication functionality within Klipboard, these email messages will be automatically sent to each individual client when a task has been marked as complete within Klipboard’s Web Dashboard. There is a Yes/No toggle which allows you to determine if you want this functionality to be turned on or off for all clients. You have the option to send a link to a feedback survey along with the client email follow up message. This will use a 3rd party link for feedback surveys, allowing for flexibility and control of the type of survey you require. You now have the ability to set up automatic reminders for your clients, so when tasks are scheduled via the Klipboard Web Dashboard, clients will receive reminder sent with a calendar invitation for the task. This is set up as default for every client, however, there is the option to turn this off if this functionality is not required.